Note for Flex 3 Systems: There is a known issue where adjusting system frame rates under the Devices pane does not modify the sampling rate. To adjust frame rates in Flex 3 camera systems, go to the Synchronization pane, switch to custom synchronization mode, make sure Sync Mode → OptiSync is set, input desired frame rate under the Internal Sync Freq (Hz) entry, and apply the customized sync configuration. Depending on which item is selected under the Devices pane, corresponding properties will show up at the bottom of the pane. All of the devices properties are persisted between different launches of Motive. These properties will be saved under the Profile XML file. 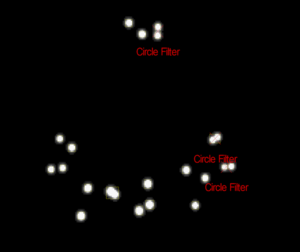 2D Object Filter section in the Reconstruction Settings pane. 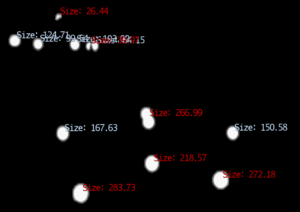 Selects whether camera FOVs are displayed in the viewport. Camera FOV accurately depicts the frustum angles, while depth is artificially capped. Actual depth may vary depending on camera settings and marker size. Enabling this feature can be beneficial in volume visualization for creation and adjustment. Valid options are True (default), False. Provides an option to turn off the camera fan during recording, for S250e cameras only. The following properties can be configured when a Camera is selected from the Devices pane. Please note that the available properties might be slight different on different camera models. 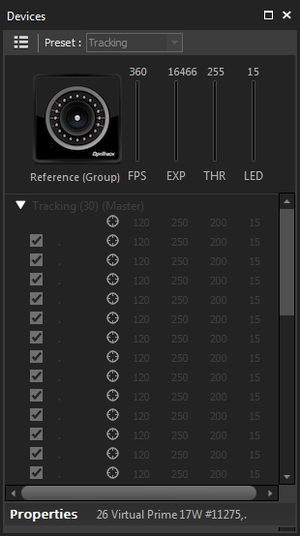 Sets the imager gain level for the selected cameras. Gain settings can be adjusted to amplify or diminish the brightness of the image. This setting can be beneficial when tracking at long ranges. However, note that increasing the gain level will also increase the noise in the image data and may introduce false reconstructions. Thus, before deciding to change the gain level, adjust the camera settings first to optimize the image clarity. Sets the video type of the selected camera. Sets the illumination to either Strobed or Continuous. Strobed illumination will output more light with equivalent power when compared to Continuous and is the ideal choice for standard motion capture volumes. Continuous is ideal for volumes where external IR interference is potentially an issue (e.g. with IR actuated stereovision systems that cannot synchronize to the OptiTrack cameras, or when other volumes may be within line of sight). Sets the camera to view either visible or infrared light on cameras equipped with a Filter Switcher. Infrared Spectrum should be selected when the camera is being used for marker tracking applications. Visible Spectrum can optionally be selected for full frame video applications, where external, visible spectrum lighting will be used to illuminate the environment instead of the camera’s IR LEDs. Common applications include reference video and external calibration methods that use images projected in the visible spectrum. (Default: False) Enables cameras to automatically adjust its camera exposure setting depending on the contrast level within the detected image. This feature is available only in Flex 3's and Duo/Trio tracking bars. 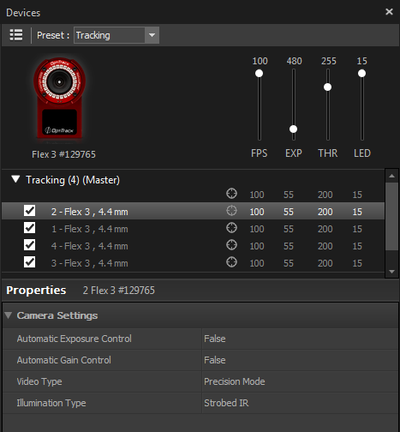 (Default: False) Thisl feature adjust the camera gain level automatically for best tracking. This feature is available only in Flex 3's and Duo/Trio tracking bars. The following properties can be configured when a force plate or a Force Plates group is selected from the Devices pane. 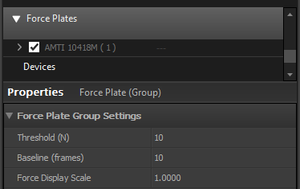 Configures whether if the force plate is triggered at recording. 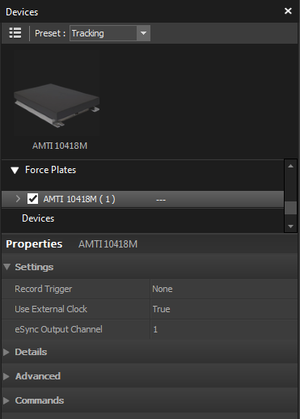 Set this to Device only when synchronizing to force plate via the triggered sync or the free run sync. Set this to true for force plates that are synchronized via external clock signal from the eSync. Set this to the output port number of the eSync that the force plate amplifier is connected to. Minimum threshold, in N, force required for the resultant force to be displayed in the view port. 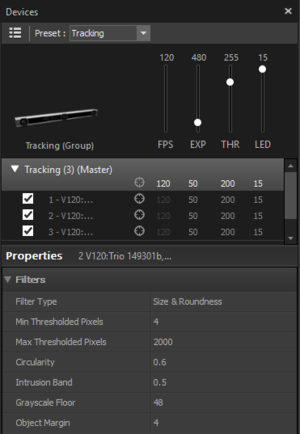 Sets the length of initial recording, baseline, frames to be used as the reference zero samples in C3D files. During the initial frames, no load should be applied to the plates. Adjusts the size of the resultant force vector displayed in the 3D viewport. [Advanced] Modifying this value is not recommended. 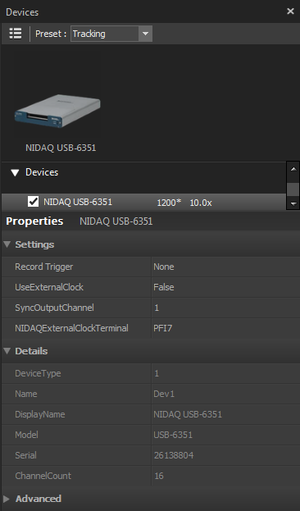 The Samples Per Event property determines how many samples are collected from the NI-DAQ device onto the hardware buffer before it gets delivered and plotted on Motive. 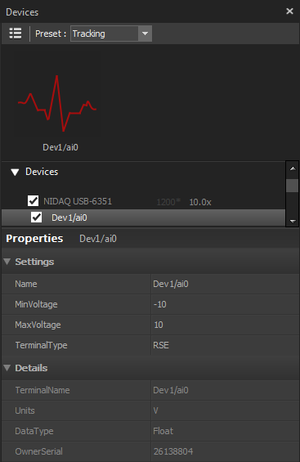 When a very large number of analog channels are integrated in Motive, this setting may need to be increased to prevent dropped samples, but in most cases, the default setting should work fine. This page was last modified on 14 May 2018, at 11:48.